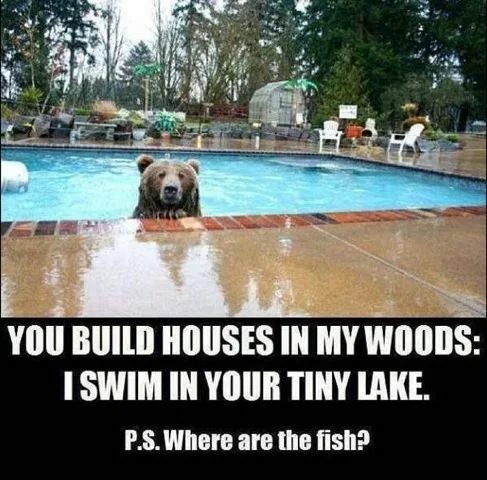 Good point Bear, good point... uhmm, just stay right there... Honey, where are the fish sticks? To many scientists and conservationists, grizzly bears are viewed as a barometer of an ecosystem’s health. Grizzlies are known as an umbrella or keystone species, terms that refer to the grizzly’s functional role within its ecosystem. The foraging behavior of an umbrella or keystone species creates a top-down effect on many other species lower in the food chain, such as ungulates, rodents, fish, insects or plant life. If the grizzly population is healthy and strong, so are these other populations from big game to native fish. Conversely, a faltering, fragmented grizzly population spells certain hardship for other wildlife, many species of which are positively affected by and dependent on the bear’s activity. The places over which brown bears historically roamed have slowly disappeared under a human blanket of development and expansion into wild, pristine areas. Over the last 200 years, nearly 99 percent of the Great Bear’s territory has been lost. During this period, grizzly numbers dropped from 50,000 – 100,000 to around 1,800 today, according to the Interagency Grizzly Bear Committee (2013). As a consequence, the grizzly now teeters on the brink of survival in the Lower 48 states. To further complicate matters in this area, much of the brown bear’s best remaining habitat lays on private ground and thus beyond the core of protected federal lands. When these lands are lost and a population of animals fails to maintain its numbers, nature’s chain is broken, bringing the species ever closer to extinction. In addition to the plant and animal species that are in danger of extinction, entire ecosystems are at risk from pollution, development and overuse. Much of the original habitat of brown bears—vast prairies, wetlands, forests and mountains—has been destroyed or developed. In fact, many people are surprised to learn that the simple act of building a logging road through forest service land is enough to drive out a sensitive species like the grizzly, which prefers to avoid humans. And so, as we encroach upon their lands acre by acre, optimal wildlife habitat is lost for grizzly bears and many other native species. The remaining grizzlies in the U.S. live in the following five distinct ecosystems: Northern Continental Divide (NCDE); Greater Yellowstone Ecosystem (GYE); North Cascades Ecosystem; Cabinet-Yaak Ecosystem; and the Selkirk Ecosystem. Sadly, there is almost no movement between these ecosystems because of the level of human activity (and roads!) in the valleys and lowlands that separate them. Recent analysis of habitat used by bears indicates that as much as 56% of the currently occupied habitat in the Northern Continental Divide, Cabinet-Yaak and Selkirk ecosystems lay on private land. In addition, nearly 30% of occupied grizzly habitat in the Greater Yellowstone Ecosystem is privately held. The lands in private ownership along streams and lower elevations tend to be some of the most productive bear habitat, providing important spring range when higher mountain country is still under snow. In fact, private holdings comprise the majority of habitat needed to reconnect the now isolated U.S. Northern Rockies grizzly populations to more robust Canadian populations—a step scientists believe is key to maintaining a healthy future for the grizzly. Vital Ground’s focus on protection of private property for grizzly bears is the answer that these scientists seek.